Organized in 1909, Paoli’s 45 volunteers provide Fire, Rescue & BLS EMS protection to the townships of Tredyffrin, Easttown & Willistown. 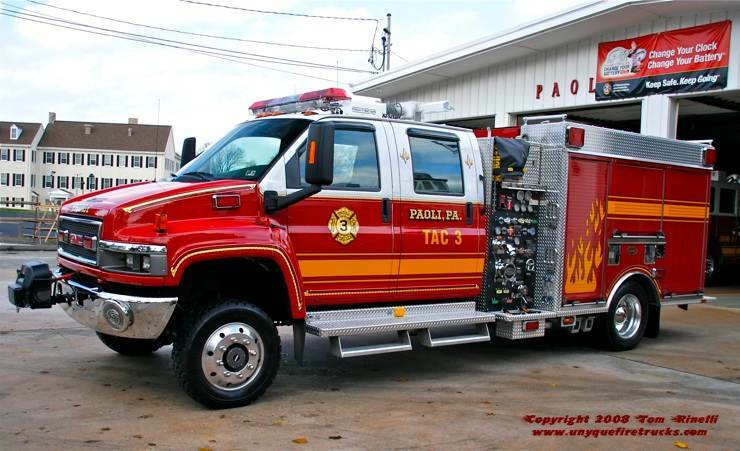 Paoli utilizes a unique staffing operation whereby two career FF/EMT’s staff the first due apparatus on weekdays while one career & one volunteer FF/EMT staff weekends. 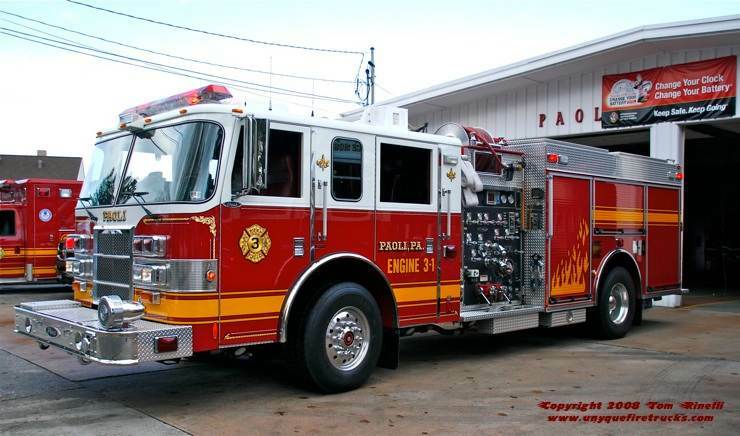 Engine 3-1 - 2003 Pierce Dash 2000 gpm/750 gal. Responding first due to residential & commercial fires as well as auto accidents, this rig features a 15kw PTO generator, light tower, winch and a 6 bottle cascade system. It is equipped with 950’ of 5” LDH supply line and an assortment of hydraulic, electric, battery & air powered extrication tools. Special thanks to career FF/EMT Eric Fedor for his assistance in positioning the apparatus for photos. Designed to provide water supply for structure & vehicles fires, it features a 10” rear dump, 1,200’ of 5” LDH supply line and a CAFS which produces pre-mixed Class A or B foam though virtually all discharges. 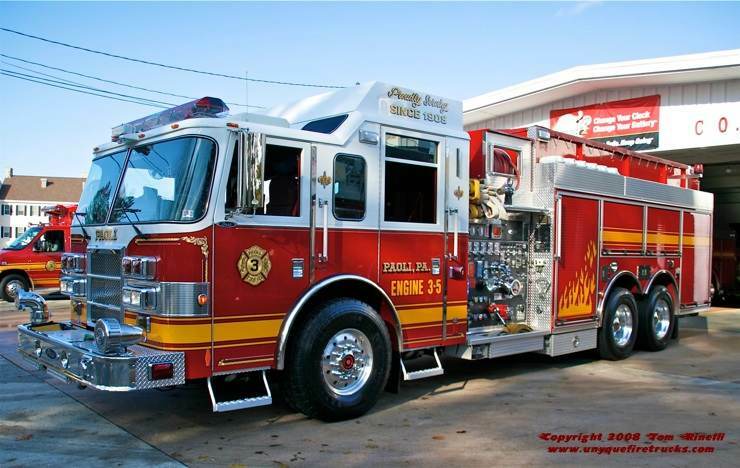 In addition, it features a light tower, 10kw generator & remote control telescoping deck gun. This unit was specifically designed for response to automatic alarms, investigations and brush/woods fires. Seating five (4 with SCBA), it is equipped with three pre-connects (two 200’ 1”, one 250’ 2”), 400’ of 5” LDH supply line, 15 gallons of reserve foam, forestry tools, a chainsaw, battery operated power tools and BLS equipment including an AED. Tower 3 - 2000 Pierce Dash “Sky-Arm” 100’/2000 gpm/300 gal. 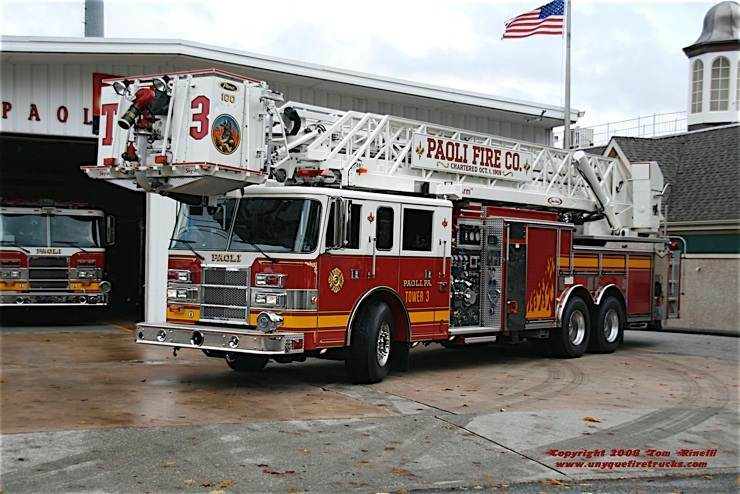 Typically responding second due to structure fires, the platform features a 15’ articulated jib on the aerial for improved “up & over” reach. Equipped with a large volume pump as well as a booster tank, this rig can act as a stand-alone firefighting unit if needed. 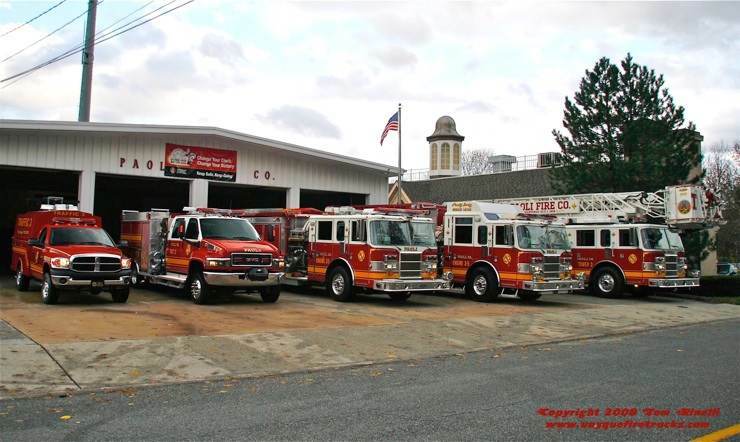 Paoli operates from this four bay firehouse with an predominantly Pierce fleet.